It's been a day of Fosters in the news at Aggborough after the club welcomed back former player Ian Foster as the new Physio in place of the now departed Jimmy Conway and a former keeper, Ben Foster, has been given the honour of being the reserve keeper for England during the World Cup finals in Germany. Ian Foster has played for the Harriers on three different occasions and is firmly entrenched in the minds of all Harriers fans as being 'Kiddy' through and through. He first joined the club when Jan Molby bought him here to score goals and that's just what he did with fourteen goals in the 01-02 season. Injury was his biggest bugbear though and he missed large chunks of seasons with his dodgy knees and that led eventually to his leaving the club in 2003 to join Chester City, although punching a Huddersfield player didn't help his cause much. 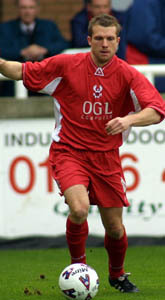 He returned to the Harriers twice more but never really had good runs in the side due to injury and spent further spells at Forest Green and Nuneaton before hanging his boots up to follow a career in Physiotherapy. He has now been put in charge of the bucket and sponge and can guarantee a massive cheer when he first runs onto the pitch to treat an injured player next season. The other Foster, Ben, was here for a time on loan from Stoke City during the Autumn of 2004 and played three times for us before he was recalled by Stoke because of injuries to their regular keepers. Amazingly, after going out on loan to Wrexham, he was sold to Manchester Utd in a million pound deal and then joined Watford for a season long loan that culminated with sterling appearances against Leeds Utd in the play off finals last week that saw his temporary club promoted. He has now been chosen as the fourth choice keeper and will only travel to Germany if one of the three first choice keepers drops out. David James, Scott Carson and Paul Robinson are the ones who will travel and Ben will have his fingers crossed that James lives up to his reputation and drops a brick on his foot. Other news from the club is that Michael Blackwood has finally put pen to paper and signed a new one year contract and former Harriers, and Reading, favourite Johnny Mullins is about to sign for Mansfield. But is he? I know otherwise!